Doug Fain, right, is sworn in as Jessamine Circuit Clerk by Jessamine circuit Judge Hunter Daugherty. MOST PEOPLE know the Circuit Clerk’s office as the place where they renew their driver’s license every four years. Yet only a small part of the office’s total workload is connected to these licenses. The majority of the workload involves the court system. The Circuit Clerk’s office, known in the Kentucky statutes as “the keeper of the record,” handles records and keeps any actions that take place in the court system, whether it be Circuit court or District court. The areas that are involved include: criminal actions, civil suits, probates, guardianships, disability actions, juveniles, mental health felonies, misdemeanors, small claims, and traffic citations. The Jessamine county Circuit Clerk’s office employs 17 full and part-time deputies and on a recent statewide staffing study found that, out of 120 counties, Jessamine ranked 3rd in the number of case filings per deputy in 2000, 17th in the total number of pre-payables, 6th in the number of state moneys handled per deputy and issued over 9000 driver’s licenses and identification cards. In fiscal year 2000, Jessamine County collected and turned over to the state in excess of $5.5 million in fines and costs. 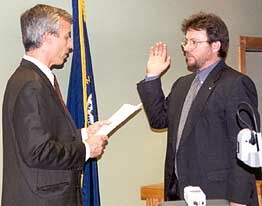 DOUG FAIN, the Jessamine County Circuit Clerk, was elected to fill an un-expired term as Clerk in November of 1998. He was re-elected in 2000 and 2006. Prior to that, he served 5 years as Mayor Pro-tem of the City of Nicholasville, and had worked in the County Clerk’s office in the 1980’s. In 2002-03, he was elected as the President of the Kentucky Association of Circuit Clerks. He was a member of the Association’s Executive Committee for 7 years and Chairman of the Legislative committee for 5 years. Within the association, he served as Chairman of the Ad Hoc committee; member of the Kentucky Circuit Clerk’s Staffing Task Force, served on the Education committee and for 2 years was the Editor of the Circuit Breaker newsletter. He has also served on the Board of Directors and as Vice-President of the Trust For Life organ donation program, In addition Doug has served as a board member of the Kentucky Criminal Justice Council. Doug is a 1980 graduate of Jessamine County High School and a 1991 graduate of the Mid-America College of Funeral Service. 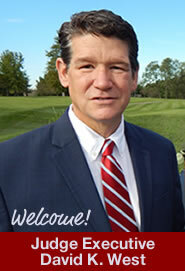 Doug continues to be licensed as a Funeral Director and Embalmer and an apprentice auctioneer. At the age of 15, he started his career as a disc jockey for radio station WNVL –AM which he later co-owned along with station WCKU-FM. He currently serves as a member of the Site Based Decision Making Council of both the East Jessamine Middle School and East Jessamine High School, is on the Board of Trustees for the Jessamine County United Way, a member of the Jessamine County Senior Citizens Board of Directors, is a past member of the Jessamine County School System Local Planning Commission and a past member of the SBDM Council of both the Jessamine Early Learning Village and Warner Elementary. He has been the recipient of both the Civic Award and the Outstanding Citizens award from the Jessamine County Chamber of Commerce. In 2010 he celebrates his 33rd year as the public address announcer for West Jessamine High School and Jessamine County High Football. In 2009 he ended a 30 year run as the Master of Ceremonies for the Jessamine County Fair Pageant. He has also been a cast member of the Paul Sawyier Story which was produced at the High Bridge Park every September. He played 4 roles: Dr. Nathaniel Sawyier (Paul’s father), the voice of character Bow Terhune (Paul’s friend at the Kentucky River), Professor Reginald Theodore Hieronymous III (showboat MC) and George Kaufmann who, along with his brother, runs Kaufmann’s store at Camp Nelson (frequented by Paul Sawyier when he lived at High Bridge). He has also, for many years, served as announcers for a number of charity events, such as Relay for Life, various horse shows and beauty pageants around Central Kentucky. He is married to Amy Carol Pritchett and has three children, Haleigh, Jonathan and Katie Beth. Doug is the son of Ruth Ann Rhorer Fain and the late Kentucky Artist Howard Fain.